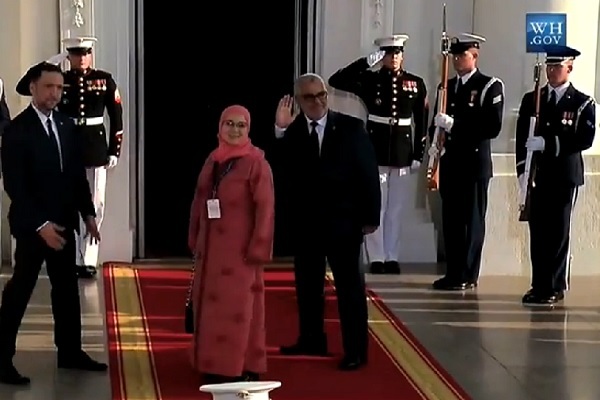 Rabat – As the former president and first lady of the United States unveiled their respective portraits on Monday in Washington D.C., Barack and Michelle Obama offered a glimpse of how they want their legacy to be seen and remembered. The Obamas’ portraits follow an established Washington tradition: the National Portrait Gallery has commissioned portraits of outgoing US presidents and first ladies since 1962. However, the Obamas are an unprecedented couple and they continue to break new ground in terms of representation and whom they entrust to represent them. 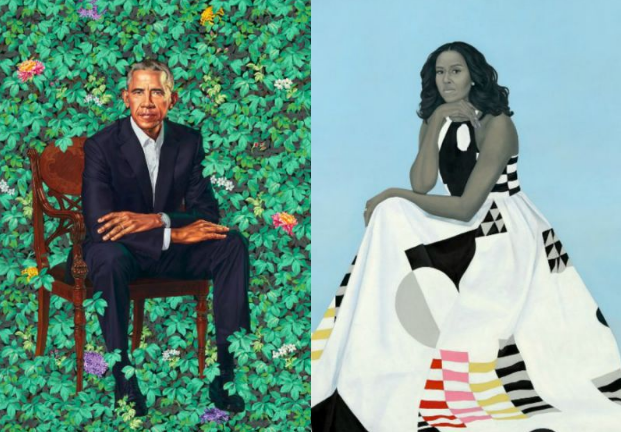 Just as Barack and Michelle Obama became the first African American couple to be featured on the walls of the Presidential Gallery, so did Kehinde Wiley and Amy Sherald become the first black artists to create official presidential portraits for the Smithsonian Institution. Reflecting to the audience, Michelle Obama admitted to feeling “a little overwhelmed” by occasion. “As you may have guessed, I don’t think there is anybody in my family who has ever had a portrait done, let alone a portrait that will be hanging in the National Gallery,” she told the press, celebrities, and politicians present. Both Wiley and Sherald are portraitists who specialize in painting African Americans and in rendering aspects of black culture. Neither of the Obamas had seen the finished product before the unveiling took place. Mr. Obama, for his part, seemed delighted with the painting, showing him leaning forward intently while seated, suspended in a verdant backdrop of vines and flowers. Kehinde Wiley is known for august portraits of African American figures and has formerly painted such icons as Michael Jackson, Grandmaster Flash, and the Notorious B.I.G. The former President admired the artist’s approach to challenging “conventional views of power and privilege,” although he asked Wiley to resist painting him “like Napoleon.” “I have enough political problems,” said Mr. Obama to laughter from the audience. While less famous than Wiley, Amy Sherald has honed another approach to African American portraiture. (Until relatively recently, she maintained a side job waiting tables at a restaurant in Baltimore, Maryland.) 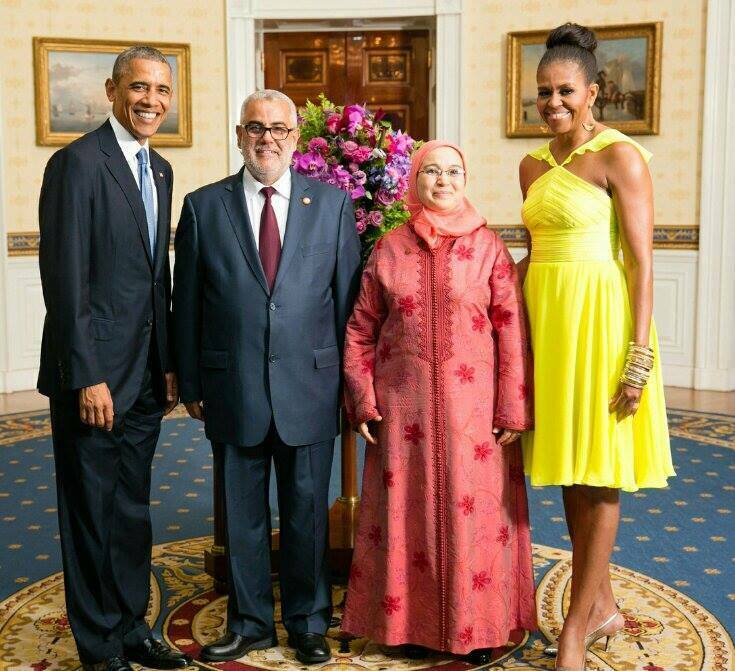 Michelle Obama appears seated, wearing a sleeveless white dress with several geometric, quilt-like patterns. Although Sherald selected a more subdued palette for her painting, her subject appears no less regal. The former first lady’s hair, arms, and face are different gray shades, which is one of Sherald’s signature ways of painting the skin tone of her African American subjects. The artist has described the influence that black and white photography has had on her style of portraiture. Sorry Mrs. Benkirane, you are wanted in the catwalk!